Home / NPFL / PRIVATELY OWNED GO ROUND FC RETURN FOOTBALL DERBY TO RIVERS STATE. 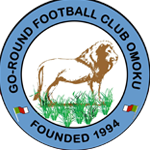 PRIVATELY OWNED GO ROUND FC RETURN FOOTBALL DERBY TO RIVERS STATE. NPFL followers this season will witness the return of football derby to Rivers State courtesy the promotion of GO ROUND FC into the NPFL and the strong standing of Rivers United. Rivers United was formed out of the Dolphins FC and Shark FC. Also worthy of note is that GO ROUND FC is privately sponsored(Felix Obua)and RIVERS FC is primarily supported by the Rivers State government.